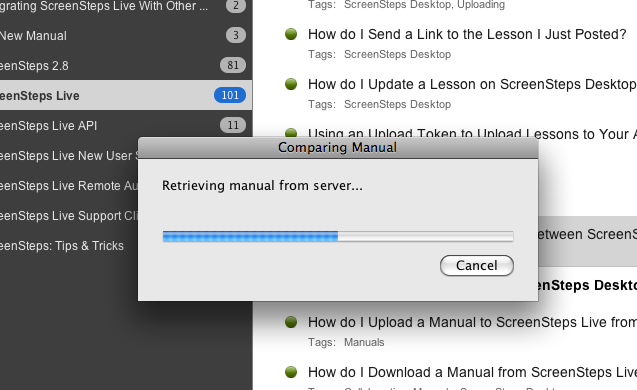 This lesson will show you how to compare your manuals in your desktop with ScreenSteps. If you are working with multiple authors on ScreenSteps or you tend to work from multiple computers this lesson will show you a quick way to make sure that you are always working with the latest material before you start working on creating or updating content. IMPORTANT - This feature requires ScreenSteps 2.8.7 or later. If you want ScreenSteps to automatically compare your manuals with ScreenSteps Live each time you open it then open preferences and make sure that Compare manuals to ScreenSteps Live when first opened is checked. To compare your manual with ScreenSteps Live manually, right click on the manual and select Compare With ScreenSteps Live > Your Account Name. Now, each time you select a manual that has been previously uploaded it will be compared to the manual on ScreenSteps. If there are differences you will receive a notification. Any lesson or chapter that is different will have a yellow warning sign next to it. Hovering over the yellow icon will display a tooltip explaining what the difference is. Prev: How do I Update My Local Manual With Changes From the Version on my ScreenSteps Live Account? 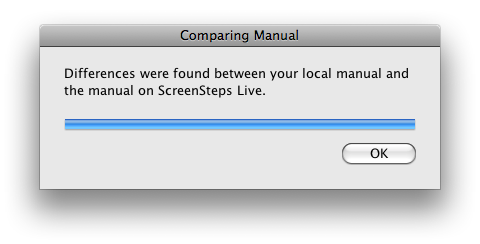 Next: How do I Download a Manual from ScreenSteps Live to my ScreenSteps Desktop Library?